Welcome to The Abso!ute Sound online! We explore music and the reproduction of music in the home. We believe that the sound of music, unamplified, occurring in a real space is a philosophic absolute against which we may judge the performance of devices designed to reproduce music. Our goal is to provide the resources consumers need to judge how a component's sound either honors or departs from the music's truth, and to make sound purchasing decisions that maximize their experience of reproduced sound. Below is our Issue 138, October/November 2002 table of contents and editorial. Stephan Harrell looks at two mid-priced turntables, Michell GyroDec SE Mk II and Nottingham Space Deck. Wayne Garcia auditions a system from Naim, one of England's most respected marques. A look at high-end audio products outside the mainstream. 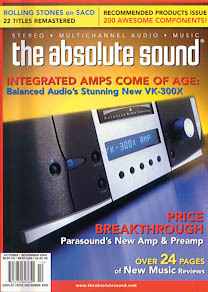 The TAS editorial staff recommends more than 200 of the best components at every price level and every product category. Shane Buettner discovers musical magic in a John Curl-designed combo that is surprisingly affordable. interconnects priced between $129 and $250. With a mix of tubes and solid-state technologies, Smart Systems tries to capture the best of both worlds in this affordable amp. Sue Kraft reports. Paul Seydor auditions the latest gear from this small, venerable company. stunning new design, according to Wayne Garcia. Anthony Cordesman puts this massive 400W monoblock through its paces. Snell enters the "big speaker" arena with an ambitious new effort. Robert E. Greene weighs in. HP brings us an updated version of his famous Super CD List. Don't turn on your system without it! Gary Giddins delves into The Genius of the Electric Guitar, Legacy's new four-disc set on jazz Prometheus Charlie Christian. Recent reissues give new life to records from forgotten rock and pop artists who helped shape today's musical landscape. Dan Davis surveys the first 15 releases in EMI's blockbuster series. Bob Gendron on SACD's ultimate coup. And yes, you'll get all your ya-ya's out. Click here to subscribe to The Abso!ute Sound..